Rihanna is on the cover of the August 2012 issue of Harper’s Bazaar. The cover and editorial spread were shot by Camilla Åkrans (who also shot Rih’s LOUD album cover and booklet) and styled by Mel Ottenberg with make-up by Mylah Morales. The theme of the photoshoot was all white but they threw in plenty of gold to keep it interesting. On the cover Rihanna wears a white gown by Calvin Klein that is stunning in it’s simplicity. Her gold bracelet is from Neil Lane Jewelry. 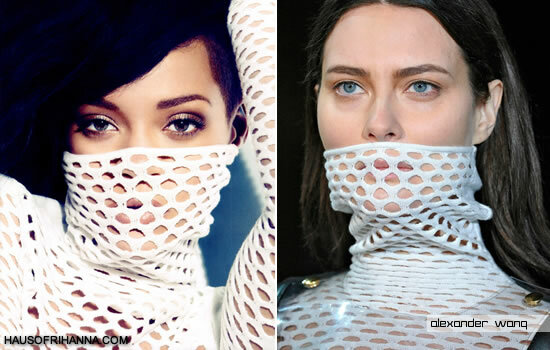 Rih sports one of her favourite designers as she pulls an edgy pose while wearing a white knit top from Alexander Wang‘s Fall/Winter 2012 collection. Rihanna embodies high fashion in a gold sequined gown by Tom Ford. Both this gold dress and the python boots are from his Fall/Winter 2012 collection. Rihanna wore another Fall dress to the Met Gala 2012. Here Rihanna looks stunning in a baroque mini dress and belt by Balmain from the Fall 2012 collection with Manolo Blahnik‘s white BB pumps. In a cropped shot Rihanna wears a gold halter neck gown with pleating. This dress is from Ralph Lauren‘s Fall/Winter 2012 collection. Rihanna wears a white keyhole top from Emporio Armani and a white skirt from Donna Karan New York with a Cartier cuff. Finally, in a totally arresting shot, Rihanna poses as the sun sets wearing a white dress with an underlayer of gold discs from Paco Rabanne‘s Fall/Winter 2012 collection.